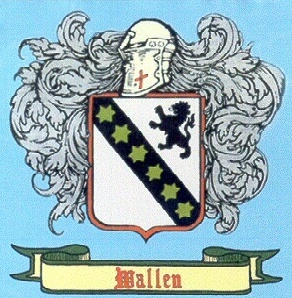 The Wallen surname is Swedish in origin(Wallén): from vall ‘grassy bank’, ‘pasture’ (see Wall) + the common surname suffix -én, from Latin -enius. Our line of Wallens came to Plymouth Colony from London, England in July 10, 1623 on the ship “Anne”. The Wallens were Baptist in belief and disagreed with the Puritans on the age at which a child should be baptized. So, they migrated to New Jersey, then Rhode Island, then Pennsylvania, and later Virginia. In historical records, their surname has been mislabeled as “Walling”, “Wallin”, “Walloon”, and “Walden”. 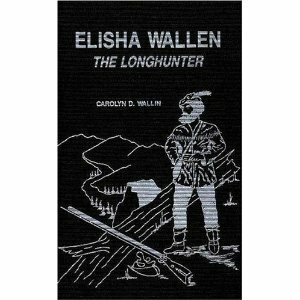 Probably the most famous Wallen was Elisha Wallen II, the Long Hunter. He was a contemporary of Simon Kenton and Daniel Boone and helped pioneer Tennessee, Virginia, Kentucky, and Missouri. At one time, he had claim to the land around the Cumberland Gap, including the present day site of Lincoln Memorial University. 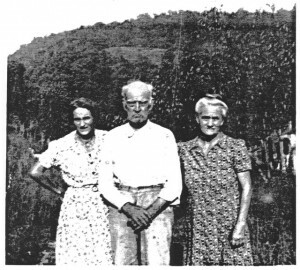 My grandmother, Esta (Wallen) Roberts, standing with her father David Wallen, and her sister, Minerva “Min” (Wallen) Fleenor in Kyle’s Ford, Tennessee. Grandma Esta (Wallen) Roberts, November, 1952, @2 years before her death. 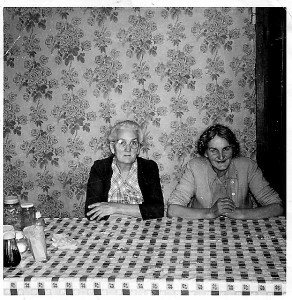 My great aunt, “Min” Minerva (Wallen) Fleenor & grandma, Esta (Wallen) Roberts. My great, great grandfather, William “Big Sandy” Wallen. Son of James Carr Wallen, Big Sandy was a blacksmith and farmer by trade and was a local legend known for his enormous strength. He served in Company L, 8th Regiment, Tennessee Calvary (Union) during the War between the States. My third cousin, Anthony Wallen. He is the son of & Martha Joe (Livesay) Wallen. 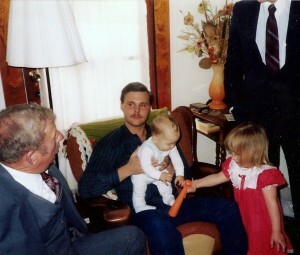 The 2 children in the picture are Anthony’s and this picture was taken @1987. 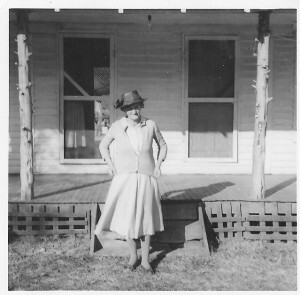 My second cousin, Martha Jo (Livesay) Wallen. She is the youngest daughter of Joe and Sophie (Baker) Livesay. Her property is adjacent to the Baker Cemetery and she has assisted in its care and upkeep for years. My fourth cousin, Jeremy Wallen. He is the son of Paul & Pat Wallen of Fairborn, Ohio. This picture was taken in 2005. If you can’t tell from the picture, Jeremy is about 6′ 7″. The Wallen log cabin, built in the 1780s by my great, great grandfather, James Carr Wallen. It still stands today in Kyle’s Ford, Tennessee. 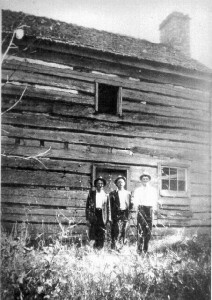 Picture was taken around 1930 and the men in the picture are:Rufus Isaac Wallen 1885-1953, Joseph Loyd Wallen 1887-1995, and Leander Wallen 1877-1957. Wallen’s Bend, on the Clinch River in Kyle’s Ford, Tennessee. James Carr Wallen settled here on 450 acres given him for his service in the Colonial Army during the American Revolution. Carolyn Wallin published this book in 1990. It tells a lot of information about the Wallen family in general. You can still find copies at www.amazon.com. Although we don’t have any actual pictures of Elisha Wallen, Jim Two Crows Wallen is an oral historian who does a good job portraying him. He is located in the Kansas City area. You can find more information about him at www.jimtwocrows.com. My Great-Great-Great Grandfather was Obiedar Lawson that married Jane England. My Great-Grandfather was whom they called Big George Lawson. My Grandfather was Obie Dar Lawson who married Gladys L. Orr. 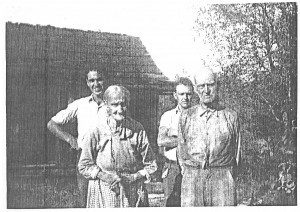 Pop and Granny Lawson lived in Stone Gap (Blackwater,Vir.) They and other family members moved to S.C. to get rich in the cotton mill in Whitmire, S.C. Along with Rollers, Wallen and Bledsoes, Bolings. Interesting, I have a great grandfather,Enoch England from Va.,mother was Eliza Creager England,she own land around Clinch River and sold to the Fishers.Her father was Michael Creager/Crager. One of my grandpa Claude Baker’s best friends was Rufus Fisher. They grew up next to the Clinch River. I have a humorous story about him and grandpa on my post about sliding down the teaberry patch. Rufus authored several Southern Gospel songs and taught my dad how to read music and sing in an acapela-style quartet. Rufus also was a Golden Gloves boxer when he was a young man. I am a relative of Henry A. Fisher in the area of Fisher Valley in the Kyle’s Ford area. Do you know what Fisher Enoch England sold the land to? 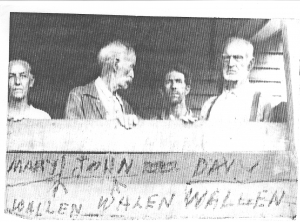 ~~~~A man by the name of Wallen was in a company of about 18 men from Virginia and explored Carter’s Valley; went through ‘Moccasin Gap’ and established a camp on Wallen’s Creek. they named Powell’s Mountain, Powell’s Valley and Powell’s River. In crossing the Clinch River, (then not named), an Irishman fell off the raft and being unable to swim, bawled to his comrades CLINCH ME! CLINCH ME! which the company did and so named the river. The group named Newman’s Ridge, Skagg’s Ridge, traveled through the Cumberland Gap “and called the mountain Cumberland, he (Wallen) having come from the county of Cumberland (Cumberland Parrish) in Virginia.” The group continued on to Laurel Mountain, but turned back after meeting Indians. I, too, am a descendent of Elisha Wallin. I am related to the GA and MO Wallins. I left a message at ‘Pictures of the Burkes. I should have put it here. Looking for something like this site for Willis ,Wilson and Lawson families of Blackwater ,VA.,SC.and TN. I have been speaking with a Wesley G.(Guy) Wallen. His mother was my dad’s aunt. Just began searching families. We are down to 2 siblings left out of 15 of my dad’s. Would love to hear any stories anyone has. I am looking for Joseph Wallin’s Mill Creek. I am a descendant of John Rice and Benjamin Green who lived there in the 1790’s. They were neighbors of Micajah Bunch. 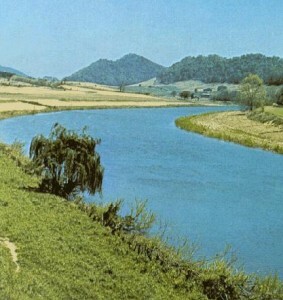 Was it Mill Creek now found on the south side of the Clinch River opposite Joseph Wallin’s land at Kyles Ford? I am a descendent of Elisha Wallen. His son, Nelson and wife Caroline Westover, are my gg grandparents. My mother is Anna Sutterfield Keathley. Anyone else out there from this line? I am a wallen. From kingsport Tennessee. My father was Wilmer Wallen, from Kingsport, where I was also born. His parents were Elmer Wallen and Bessie Roberts. Any relation? Dan, we have had previous contact but it has been so long I don’t recall our subject for discussion. I am a descendant of Micajah Bunch and am wondering if you ever got the answer to your question listed on this site (“My Longhunters”)? -I would love to know exactly the land on which Micajah lived so I could sometime visit it. A few years ago I traveled once to Kyles Ford but at the time I had no idea where to search. Would love to hear from you and about your latest research. I am a Bunch. I put up a bunch cousins website a few years ago but have been taking time off from resesrch (although I continually poke around for stuff). Are you still resesrching? My name is Janice Stanley Duffy. I am trying to find more information on my third great grandfather and wife. He is Isaac R. Bledsoe born 1794 Scott Co. Va and it is believed he married Milly Wallen Pridemore or Pridemore Wallen. I am assuming she was married before she married my grandfather. It is believed she was born 1799. I would surly appreciate any information you may have. Their daughter Sarah Virginia Bledsoe married James W. Livesay and their daughter Mary Jane Livesay is my great grandmother. I am the GGGG grand daughter of James Carr Wallem, who was Elisha Wallen’s brother. On my father’s father’s side. and my father’s mother was Grace Sizemore. There Is no doubt in my mind that we have to be related. My GGGG grand father was also known as BIG Sandy. Interested in learning more about my Roberts walling/wallen blood line. I am in the book of reuben & defendant of elisha long hunter. I to am in the Book of Reuben. Would love to exchange info, pictures & stories. I’m also related to Elisha ggggg grandfather. I would like any information you may have. James Carr Wallen was also my 4th g grand father. He was the father of William Wallen. 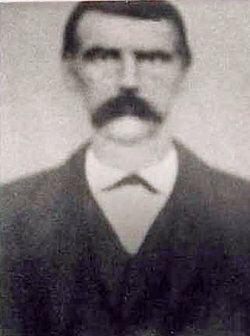 William Wallen was the father of Icy (Wallen) Gilliam. Icy was my grand father’s mother. Who’s name was William Gilliam. He is the father of Albert Ray Gilliam. Who is my father. I am Carolyn (Gilliam) Crowder and my daughter is Danielle (Shook) Jones, who is the mother of Eli and Lainey Jones. And Eli is short for Elisha Jones. In which James and Millicent(Jones) Wallen are James Carr and Elisha Wallen’s parents. Weird how life goes back around some how. HUH? Do you have any of these stories written on any websites? Jerry Lynn walling: Do you have any of these stories written on any websites? I would love to read them. the walling family 1623 2 1945 compiled by Maudie S Walling Dallas Texas. in the village of Hulton-two and one-half miles east of Lancaster England near the mouth of the Irish Sea- where river Lube flows, the name of walling is found as far back as Queen Elizabeth.James John and Thomas be the names used at regular intervals. (from a letter by Thomas walling Director of Education City and County of Newcastle January 11th 1934)the ship Ann sailed from the Port of London arriving at Plymouth in 16and his wife Joyce aim on the ship Came on the ship. (from marine society Salem Massachusetts October 20th 1932. Yes, Jerry you should write a book. I would buy as well. Hi Tamara. Could you give some more detail on that please? 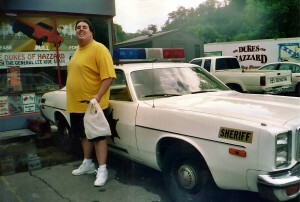 I had a cousin named Troy who lived on Big Sycamore in Claiborne County Tennessee. Are you related to him? I see your picture of what you names Big Sandy Wallen. He was my Grandpa Wallens father. My grandpa was William Jasper Wallen, Floyd County Kentucky born in Wise County Va. I am looking for documented facts of the Wallens ? I’m working on Walling/Wallen/Wallen in the American Revolution and have about 34 men! Contact me at richwalling@hotmail.com for more info. In ten short years, we’ll celebrate 400 years of our family being in America! I am Robert D. “Huck” Walling, Jr. and live in Oklahoma. I am a member of Sons of the American Revolution, so why genealogy was vetted very thoroughly, as the SAR is a genealogical society. I would be happy to exchange information with you if you are interested. We’ve done Family Finder and Y-DNA on FTDNA. My brother is a direct male descendant of Elisha Wallen and Mary Blevins. A couple of the names I keep coming up with are Bolling and Whitsel. Does anyone know how these two names tie into the Wallin/g line? I am also a descendant of Elisha Walling, 12th generation, my father was Odis Walling born in Antlers Oklahoma. I would love to have more information on this family, it is so interesting to read. Thank you for compiling this, a lot of time and effort is appreciated. I live in Willows California. My name is Rebecca Lynn Reed Walling. I am also a descendant of Elisha Wallen. I have visited the Wallen cemetery in Washington County Missouri where Elisha and Mary Hughes Wallen are buried. My ggrandmother was Alice Wallen Sago. I’m hoping someone can assist in helping me confirm the family history that I’ve found, my grandfather Maurice Thomas Wallen was born in Ironton, Missouri 1919, parents were Harry Charles Wallen (1883-1947) & Effie Alice Keesling; I show Harry’s parents as Thomas E. Wallen (1858-1928) & Jane Smith; Thomas’s parents: George Washington Wallen (1839 – 1864) & Arminta Grinder; George’s Parents would be Elisha Wallen III (1795 – 1872) & Mary Hughes. Would love some confirmation of this if anyone has it! Have you checked on RootsWeb…Joel Hagar’s Southern West Virginia Research…my great grandparents are Martin Wallen and Jane Ellis…this is I how I found my Wallen line, and I recognize names you have down…hopefully you can find your line. I did mine. I’m doing some research on Kyles Ford, Tennessee for a novel I’m writing and was wondering if you had any information on Wallen’s Grocery Store. Is it still standing today? Do you have any pictures I could refer to? If possible please email me at kaleyg@sbcglobal.net with any information you might have! Thank you so much!! 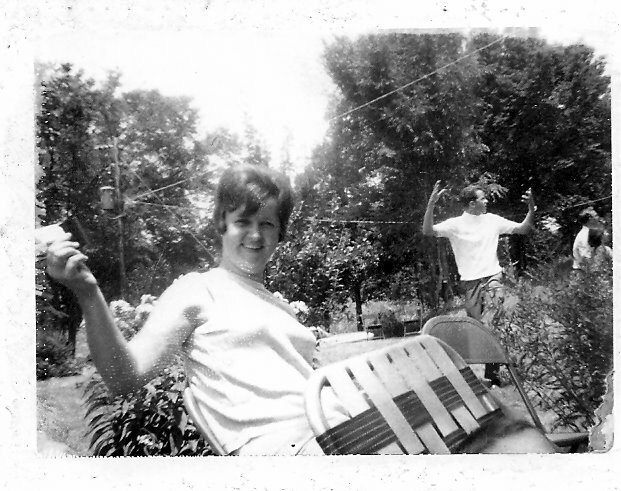 Looking for parents of William Wallain married Nancy Ramey in TN. They migrated to AR then OK. He’s also been listed as Waldon. My Maiden name is Shelley Kaye Wallen. My grandparents were both German on my dads side. Hello! I am just wondering if you happen to have any more pictures of the house “Big Sandy” Wallen lived in? My grandparents live in that house!!!! They had to cover the old logs up to preserve what was left. This is very cool and Interesting. Thanks!! Elisha Wallen is my 6x great grandfather. It was a treat coming across your site! There’s a lot of excitement in this lineage for sure! This my line as well, thank you for sharing the photos. Ralph (1595 – 1644) Find A Grave Memorial# 34718554 married to Joyce ? First line should also have Ralph Walling/Wallen I D.O.B. 1570 Yorkshire, England, United Ki from…married Margaret…our family line starts off the same, then it branched out…Elisha is my 6th great grandfather. Yours goes to Joseph Allen and mine goes to his brother James Walling. This site is amazing. Thank you for sharing. Any Waldens out there? I am descendant of Lord John Walden. My name is Debbie Kay Wallen. My great grandfather was James Augusta Wallen who was in law enforcement and killed in the line of duty. They were the second family ti settle in Del Rio, Texas. I’m looking for information on this family line. Please contact me if and when you have the time. You and I descend from the same Blevens line, Elisha Wallen, SR.
Hi Everyone! This is very exciting! 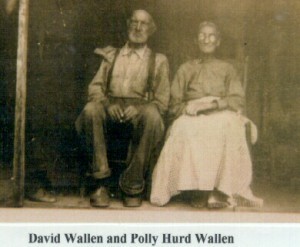 Elisa Wallen and Mary Blevins were my fifth great grandparents. My great grandparents were William Hogan Wallin and Bonnie Maude Castor and my grandmother Willa Maxine Wallin whom I love and adore married to Robert Leroy Felsch. Jones was her second marriage. I am kin to the Wallens also, I come from William Roberts and Elizabeth Wallen Roberts. For Jeff Roberts, thanks so much for putting all this history out there. I left a note how to get in touch with me under the Roberts Pictures section. Elisha Walling (Wallen) is my 5G Grandfather My Paternal Grandmother “Ida May Walling Kennedy” is laid to rest in the Pilgrim Cemetery in Elkhart, Texas. Found this site and thought I would share this with all my cousins here on this site. Elisha Walling was born on 26 July, 1708 in Cohansey, Salem co, NJ. and apparently spent his childhood in this area. In an addendum to his will dated 22 Oct. 1724 Thomas Walling II, authorized his wife Sarah to bind out their son Elisha (then age 16) to a trade until he reached age 21. In 1733 Walling’s appeared on a list of tithables in the Monocosie Hundred in Prince George’s Co, Md. In 1745 Elisha walling appeared in Lunenburg Co. from Smith Rivers where he made his home at a place called “Roundabout”, located about two miles east of the present town of Martinsville, Va. and east of Blue Ridge. In 1747 , he entered 400 acres on the north fork of Buttram Town creek. In 1748, he was appointed constable of Western Lunenburg Co. from Smith River to the Wart Mountains (territory later to become Henry and Patrick Counties) and entered and had surveyed 400 acres of land on the Sandy River (6 July 1748). In a court meeting held for Lunenburg Co. in June 1748, Elisha was appointed surveyor of part of a new road from the Staunton River to the Mayo Settlement, leading from Bannister to the Smith River. From 1751 to 1757, this land was in Halifax Co., and beginning in 1767, was in Pittsylvania Co. On 17 July 1767, a list of tithables taken by Peter Copeland, Gentleman, for Lunenburg co., shows Elisha Wallen, Sr. and his sons Joseph and James Wallen and Capt. Williams Blevins. b. 1732 in Prince George Co., Md. This Elisha Walling was of dark skin, black hair and black eyes. One of the stoutest men in Virginia, New River, Surry County. The story is that his name Elisha came from his mother’s side of the family. His mother was Sarah Elwell, whose mother, Sarah Bassett had a brother named Elisha. I read where he was buried in New River, Scurry Co., Va.
the history of the Walden family is traced from John Walden, son of Lord John Walden of Ravensworth Castle, England, who settled in Leyton, Essex County Virginia in 1715; moved later to his home, Walden Towers, in Caroline County, site of which is about nine miles from Bowling Green. Elisha Walden married Mary Blevins, daughter of a neighbor, Will Blevins. In 1748, Elisha Walden was appointed constable of Western Lunenburg County, from Smith River to Wart Mountain. In 1749, he was surveyor for new roads. In 1767 Elisha was elected Captain of a Company of Miltaria for Pittsylvanie Co, Va. under Major Theophilas Lay. Elisha Walden was a member of Lee’s Legion, Continental troops, during the Revolutionary War. Lee’s Legion was organized in Virginia and was instrumental in driving British General Nathaniel Green southward to Charleston, where he surrendered. A legal firm from Baltimore was employed by the descendents of Lord Walden in Virginia to recover their share of the English estate. However, the castle had been taken over by the Crown and the suit failed. The History of Pittsylvania County” by Maude Carter Clement. 1929 J. P. Bell Company, Inc. Another sketch is also in “Tennessee Cousins” by Worth S. Ray. …neither Mrs. Ida Walling, nor Mrs. Clement could help me close the gap between 1724, when at the age of 16 Elisha was left fatherless, and 1745, when he first appears in the southern Virginia records. His father, in a codicil to his will, dated Oct 1724, “authorize my wife to binde out my son, Elisha Walling, to a trade as she shall see meet till he hath attained the age of twenty-one after my death and that my said wife shall not be controlled for doeing by any person or persons whatsoever.” Whether Elisha was ever bound out to a trade or not is undetermined. I can find no record in New Jersey either of apprenticeship or guardianship for him. Neither can I find a public record of his marriage, nor a record of the birth of his children. The original Thomas, being a follower of Roger Williams, embraced the Baptist faith. Indeed, some of the New Jersey records of the Walling family are found in the Baptist church records there. It would be sometime between 1724 and 1745 in which Elisha married Mary Blevins. I can only guess but it is my opinion that Elisha went to Maryland. The only other Walling record in Pittsylvania County is contained in the Vestry Book, recorded 28 Nov 1771: John Cox, John Blevins, Thomas Walling and John Talbot is appointed possession of all the patented lands from Randolph up River to Buttran Town and to the Ridge. There are numerous Blevins claims. John Blevins, son of Daniel– one tithe. Following this date there are numerous entries to the WALLING name. A county military organization was set up for Pittsylvania County in 1767. Among those listed is “Captain Elisha Walden.” The War Services Administration has a Revolutionary War Record for one Elisha Walden, who served in Lee’s Legion between 1777 and 1779. If we accept July 1708 as Elisha’s birthdate, the it would seem that this war record refers to his son, Elisha Jr. The last account of Elisha Walden in Virginia is contained in a Washington County, Virginia account of his return on 25 March 1785 to his old home near Callands when “the old pioneer and hunter, Captain Elisha Walden of Holstein River, Tennessee, returned for a visit” and was tendered a tremendous reception. Betsy Walling, b. Abt. 1727, d. date unknown. 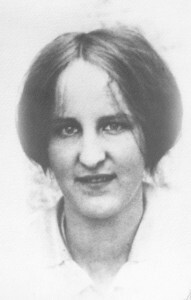 Sarah Walling, b. Abt. 1728, d. date unknown. Thomas Walling, b. Abt. 1731, d. date unknown. +Margery Walden (Walling), b. Abt. 1738, New River, Surrey, Virginia, d. date unknown. Son, James W. is missing. My aunt had out family tree that has Elisa wallen as descendant.my dad is David pawpaw omer an great pawpaw harley.all have middle name lorin.heard my hole life my family was from blackwater. Thank you so much for sharing these wonderful photos.